Brand Identity & Packaging Design Faced with the possibility of an oversaturated U.S. market, Nasett International Corp., makers of the Modules line of men's dress furnishings, was looking beyond America's borders for global growth of the brand. But breaking into the overseas market has not been easy for the Tokyo and New York based Japanese accessories company, noted Toshiya Takahashi, president of Nasett, which makes neckwear, hosiery, and, most recently, dress shirts. "To be Japanese and successful in the menswear market you need more than a good product and determination. You need a strategy, and, just as importantly, you need to understand your competitor's strategy," said Takahashi. 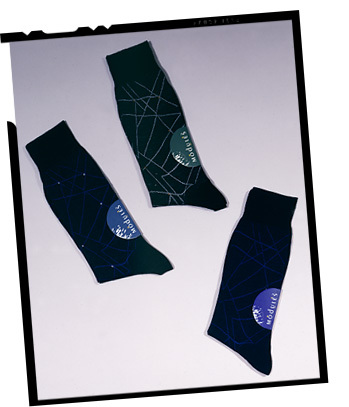 Nasett commissioned Design Latitudes to develop a brand strategy and packaging concept for its line of men's hosiery based on our experience in Japan with the Sanko New Media and Postmodern Kyoto programs. The European orders this time around increased. "We got a lot of attention. The international purchases have done very well," Takahashi says with a smile. "We got calls right away for repeat orders."